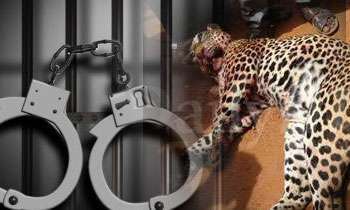 The four suspects who were arrested by the Kilinochchi police over the leopard killing incident was remanded till June 29 by the Kilinochchi magistrate today. What a country ! . In the South the Sinhalese are brutally killing one another on a daily basis and even the Police are committing summary executions. But the Northern Tamils killing a Leopard that had attacked villagers is a focus of a major judicial inquiry. It is sadly hilarious,the world is watching and making up its mind about the South and the North. In the North we have not really completed the job well ... which means there are some terrorists especially those who commits terrorism against the nature and wildlife ... that was the biggest single mistake. sadly hilarious ? Probably to an uncivilized mutt like you not for the international visitor. These cruel Tamils should be given long term prison sentence. These people are so heartless,I mean yes I understand it attacked them ,other than brutally kill the poor animal they could've sedated the creature, these innocent animals deserve to live too. On top of that these villagers are videoing it like as if they getting entertained seeing the animal suffer. Being a animal lover they should be punished and people should create an awareness among these areas. Why suspects there is proof video on social media and check FB for selfie. Please give him condition bail hence he has to look after his family. As per my view they fight for their life. What the hell are you talking about, man?? Please be undemocratic with this case. These garbage, products of war should be skinned alive and thrown to the dogs, or better still, hand them to FM Sarath Fonseka because he is the current wild life Minister.